Rating: 5 Bites. Must read! "The Dry Creek Middle School drinking fountain has sprung a leak, so principal Walter Russ dashes off a request to Flowing Waters Fountains, Etc. ...We need a new drinking fountain. Please send a catalog. "I'd be delighted...but please understand that all of my fountains are custom-made." 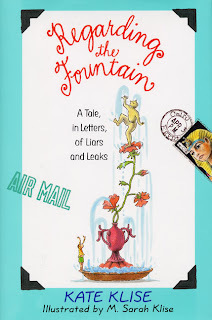 Soon the fountain project takes on a life of its own, one chronicled in letters, postcards, memos, transcripts, and official documents. The school board president is up in arms. So is Dee Eel, of the water-supply company. A scandal is brewing, and Mr. Sam N.'s fifth grade class is turning up a host of hilarious secrets buried deep beneath the fountain." I told you I'd have an "old" book update soon! This one could have worked too for the Under the Sea giveaway....fountain....water...good enough! This book is so clever. If you have reluctant reader, this one should help entertain. It's a SILLY novel and since it's written in letters, memos, postcards, etc, it's mostly just "conversations". I'm the type of person who sometimes gets bored with overdescriptions but loves the talking parts, so this book was much more that....talking. The ending had some newspaper clippings and other documents ("documents" for fear of sort of spoiling) that weren't as "conversationy" which bored me a little, but you could skim through those to get to the good parts. Everyone's name in the town also has a water theme, so watch out for that....Sam N. ... Minnie O. This book is just the first in a series of "Regarding the....." presumably about fixing up their school. It's funny. Not your laugh out loud, but entertaining! I mean they wanted a new drinking fountain....how will they end up with a FOUNTAIN fountain? And it's a clean read. For ages 8-12, says the publisher, but I'd think even high schoolers could like this one. It's just so different than the usual and fun! Paperback is also available on Amazon here . <---and at it to your goodreads by clicking that!